Fontaine, Myriam. "Pierre Karl Péladeau". The Canadian Encyclopedia, 03 January 2017, Historica Canada. https://www.thecanadianencyclopedia.ca/en/article/pierre-karl-peladeau. Accessed 24 April 2019. ​Pierre Karl Péladeau (nicknamed PKP), Canadian entrepreneur and businessman who was instrumental in bringing about the rapid growth of Quebecor (born 16 October 1961 in Montréal, QC). He was the president and chief executive officer of Quebecor for 14 years, from 1999 to 2013. In the Québec provincial election held on 7 April 2014, Péladeau ran as a candidate for the Parti Québécois and won his riding. On 15 May 2015, he became the eighth leader in the history of this political party. Pierre Karl Péladeau, Canadian entrepreneur and businessman and native of Québec, was born in Montréal on 16 October 1961. Son of the prosperous businessman Pierre Péladeau, who founded Quebecor, Pierre Karl earned a BA in philosophy from the Université du Québec à Montréal in 1983 and then a law degree from the Université de Montréal in 1987. He joined the management team at Quebecor in 1985 and helped to develop Imprimeries Québecor (see Print Industry). He played a leading role in the success of the Donohue paper mill, one of Quebecor’s best-performing pulp and paper subsidiaries from 1987 to 2000. Builder of Quebecor Media inc. In 1991, P. K. Péladeau was appointed president of the Quebecor Group, a collection of companies operating in the publishing, distribution, and retail sales sectors. In 1994, he moved to Paris to increase the size of the workforce in the European division of the company, and, in three years, the company became the main commercial printer in Europe. After the death of his father on 24 December 1997, Pierre Karl returned to Canada. In 1998, he led Quebecor’s successful efforts to acquire Sun Media Corporation, which made Quebecor the second largest company in the Canadian magazine industry. Following this acquisition, Quebecor’s board of directors appointed Péladeau president and chief executive officer of the company. In 2000, with the help of the Caisse de dépôt et placement du Québec, Quebecor acquired Videotron Ltd., the largest cable services provider (see Cable Television) in Québec and the third largest in Canada, and TVA, the largest French-language television broadcaster in North America (see Radio and Television Broadcasting). These companies were grouped under the new subsidiary Quebecor Media inc., bringing together all the telecommunications and entertainment activities of the company. Quebecor grew yet again in 2007 with the purchase of Osprey Media, the owner of 20 daily newspapers, 34 non-daily newspapers, buyers’ guides, magazines, and specialty publications distributed in a number of regions across Canada. As a result of this acquisition, Quebecor became the largest media conglomerate in Canada. The late 2000s were notable for the expansion of Videotron Ltd., which became one of the leading providers of Internet, telephone, and telecommunications services in the country. As for TVA, it joined forces with Sun Media Corporation to buy the television station Toronto 1, which later became Sun News. TVA also launched new specialty channels and Sun TV, an English-language general content television station. Today, Quebecor Media inc. operates a vast network of Internet properties in both English and French. Nurun Inc., another subsidiary of Quebecor Media inc., has succeeded in becoming a major player in interactive technologies and communications in Asia, Europe, and the United States, as well as in Canada. Quebecor Media inc. is involved in the publishing of books (Quebecor Media Book Group) and magazines (TVA Publishing Inc.), the production and distribution of cultural products (Archambault stores and TVA films), and the rental and retail sale of DVDs and video games (Le SuperClub Vidéotron ltée). In less than 15 years, Pierre Karl Péladeau dramatically changed the face of the company built by his father. At the beginning of his term as president in 1998, Quebecor’s activities were concentrated in the printing and the pulp and paper sectors (which accounted for $7.9 billion of the company’s $8.4 billion in annual revenue). In 2009, the picture was totally different. The company at that point was focusing on the telecommunications sector, which accounted for $2 billion of its $3.8 billion in revenue). Although the phenomenal growth of Quebecor in the 2000s was impressive, it was not free from controversy. In fact, Quebecor’s success was the result of a major restructuring of the company by the president. The conflict between Quebecor and the journalists’ union at the Journal de Montréal from 2009 to 2011 and the closing of various daily newspapers throughout the country were difficult, sensitive issues associated with Pierre Karl Péladeau’s term as president. In 2008, the financial troubles of Quebecor World, a publishing subsidiary of Quebecor, dealt a heavy blow to the company directed by Péladeau. Quebecor World ultimately sought protection under the Companies’ Creditors Arrangement Act, which allowed it to restructure. Six months later, Quebecor World sold its European companies to a Dutch group. In 2009, Quebecor World was renamed World Color Press, and the company concentrated its activities in the Americas from that point on. Like his father, Pierre Karl Péladeau believes in the democratization of culture and is very involved in the cultural community. This involvement takes various forms, from sitting on a board of directors (the Fondation Lionel-Groulx, an organization dedicated to the promotion of Québec’s history) to making donations on behalf of Quebecor for the expansion of a museum (the Fondation du Musée national des beaux-arts du Québec) or the acquisition of objects that belonged to an artist (the Musées de la civilisation in Québec City). A scholarship awarded annually by the philosophy department at the Université du Québec à Montréal bears Péladeau’s name, and Québec’s large hospital foundations benefit from Péladeau’s generosity too. Péladeau is a great fan of cycling and sponsors the professional cycling team Garneau-Québecor. Since 2011, Québec Nordiques fans have also found him to be an invaluable ally. He is engaged in negotiating the return of the team to the National Hockey League, and Quebecor has become the main financial partner of Québec City in the construction of a new multifunctional arena. Since 2011, Pierre Karl has been chairman of the board of the Fondation de l’entrepreneurship. Municipalities and chambers of commerce regularly invite him to be a guest speaker. On 14 March 2013, Péladeau announced that he was leaving the management of Quebecor. He wanted to take up new challenges, spend more time with his family, and become even more involved in philanthropic work. He did, however, keep his position as chairman of the board of Quebecor Media inc. and of TVA. On 17 April 2013, Québec’s premier, Pauline Marois, appointed Péladeau as chairman of the board of Hydro-Québec, the largest Crown corporation in Québec and the biggest producer of hydroelectricity in Canada. After months of speculation, Péladeau made the jump to provincial politics. On 9 March 2014, he resigned from his remaining management positions at Quebecor Media inc. and announced his candidacy for the Parti Québécois in the riding of Saint-Jérôme. At that time, he spoke of his profound attachment to the values of the party, including the goal of Québec independence. By presenting himself as a candidate, the media magnate hoped to foster Québec’s prosperity, as he had done as the head of the company his father founded. The announcement of his candidacy sent shockwaves through the campaign, but it was his decision to keep his shares in Quebecor that caught the attention of the media and the political class. A number of sovereignty heavyweights, including Gilles Duceppe, Jacques Parizeau and Lise Payette, came to his defence because, in their opinion, it was crucial for the province to keep control of the company and for its head office to remain in Québec. Despite the crushing defeat of the Parti Québécois on 7 April 2014, Pierre Karl Péladeau won in the riding of Saint-Jérôme. Péladeau is one of the people being encouraged to run and become Pauline Marois’s successor. He was seriously injured in a bicycle accident on 18 May 2014, but he still managed to enter Québec’s National Assembly, in a wheelchair, 12 days later. On 19 June 2014, Brian Mulroney, former prime minister of Canada (1984–93), succeeded Robert Dépatie, who himself had taken over from Pierre Karl Péladeau as head of the Quebecor empire. On 27 November 2014, Péladeau announced his bid for the Parti Québécois leadership at the Université de Montréal, where he was giving a speech to students. He would run against five other candidates: Jean-François Lisée, Martine Ouellet, Alexandre Cloutier, Bernard Drainville and Pierre Céré. On 23 January 2015, Lisée withdrew from the race before it had officially begun, convinced of Péladeau’s eventual victory. Péladeau won the first ballot on 15 May 2015 (with 57.6 per cent of the vote), making him the eighth leader in the history of the Parti Québécois. However, on 2 May 2016, Pierre Karl Péladeau announced his resignation as leader of the Parti Québécois, leader of the official opposition and Member of Québec’s National Assembly for the riding of Saint-Jérôme, citing family reasons. 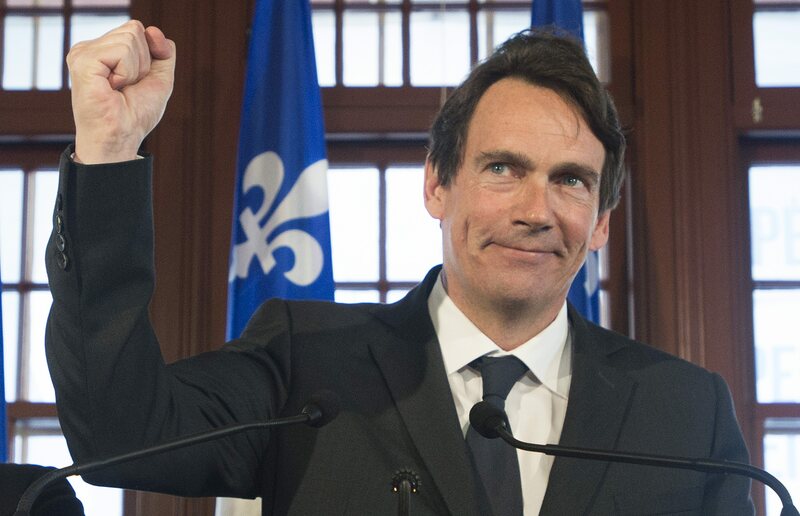 Martin Patriquin, "Pierre Karl Péladeau: The King of Québec," Maclean’s, 4 September 2013. Martin Patriquin, "The Transformation of Pierre Karl Péladeau," Maclean’s, 25 September 2014. Monique Muise, "Pierre Karl Péladeau joins the PQ leadership race," The Montreal Gazette, 27 November 2014. Frédéric Tremblay, Pierre Karl Péladeau. Biographie (Montréal : Les Intouchables, 2014). QuebecorThe website for Quebecor, a leading Canadian integrated communications company. Chaire de recherche en éthique du journalismeCheck this site for articles on journalistic ethics. From the University of Ottawa. In French. Pierre Karl PéladeauPolitical profile of Pierre Karl Péladeau (Saint-Jérôme). From the website for the Assemblée nationale du Québec. In French. FONDATION DE L’ENTREPRENEURSHIPThe website for the Fondation de l’entrepreneurship which promotes and supports entrepreneurs and their projects in Québec.